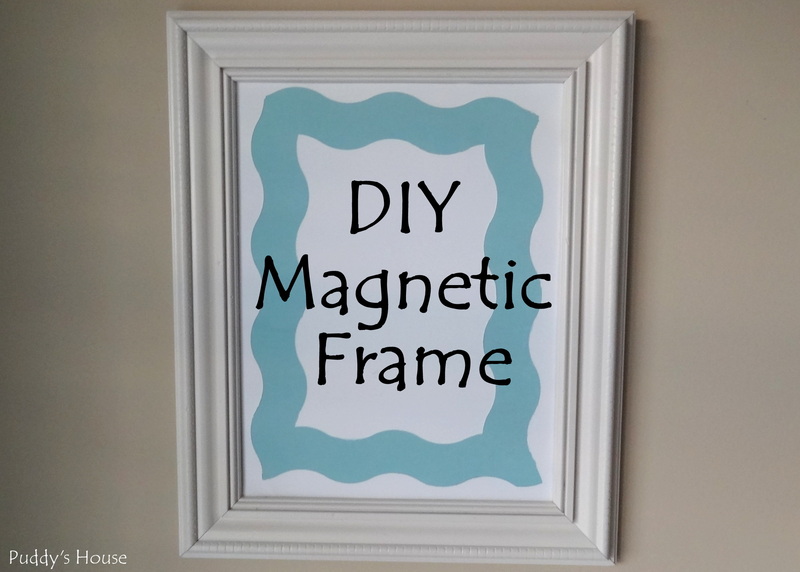 Months ago I set out to make a DIY Magnetic Frame. I wanted to have somewhere to put the magnets we receive from friends and family when they travel. 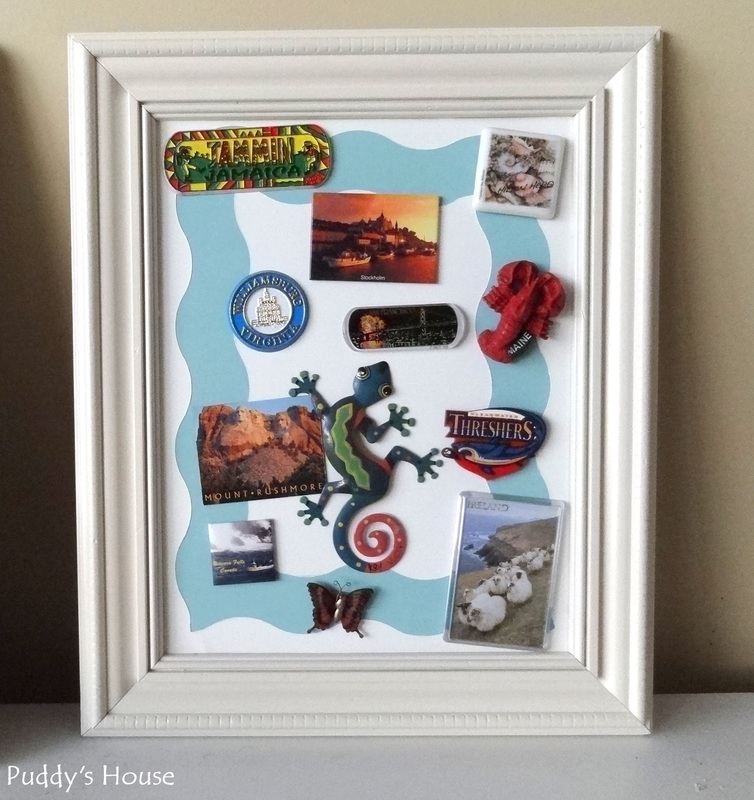 Bob and I collect magnets from our travels too, and we put them on the refrigerator. Since, I don’t want the fridge to be too cluttered, I wanted another place for the magnets. 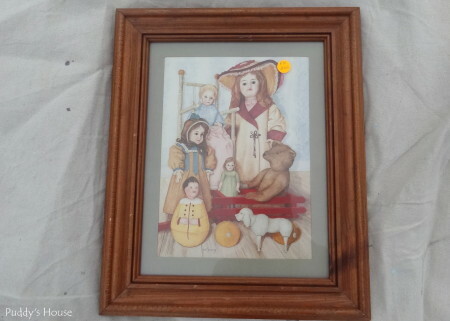 I started with a yard sale picture. I definitely didn’t buy this for the picture. Strangely, I bought this same picture/frame another year at a yard sale too! But, no one would know since that picture was transformed too. I separated the frame from the glass. 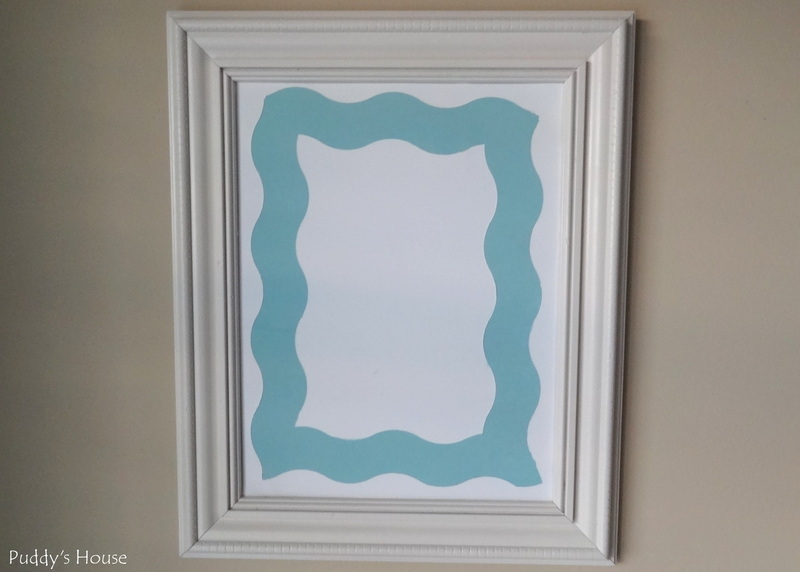 The frame got sprayed with Rustoleum’s Heirloom White, my go-to white paint. 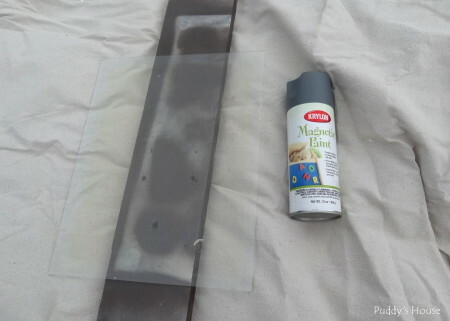 My plan for the glass was to coat it with Krylon’s Magnetic Paint. I had never used magnetic paint before, so I carefully followed all of the instructions. I knew shaking the can well was important, as was multiple coats. I think it took me two different weekends of spraying, since it needed so many coats. I checked in between if it was magnetic enough, but it wasn’t. So, I ended up spraying it with the whole can. Unfortunately, even after a whole can it was not magnetic enough. I could get a magnet to stick in a few spots, but not many. I didn’t know what to do, but of course other people came to my rescue. It was so long ago, I can’t remember how the solution came to light, except for that it was The Kim Six Fix who suggested I try sheet metal. 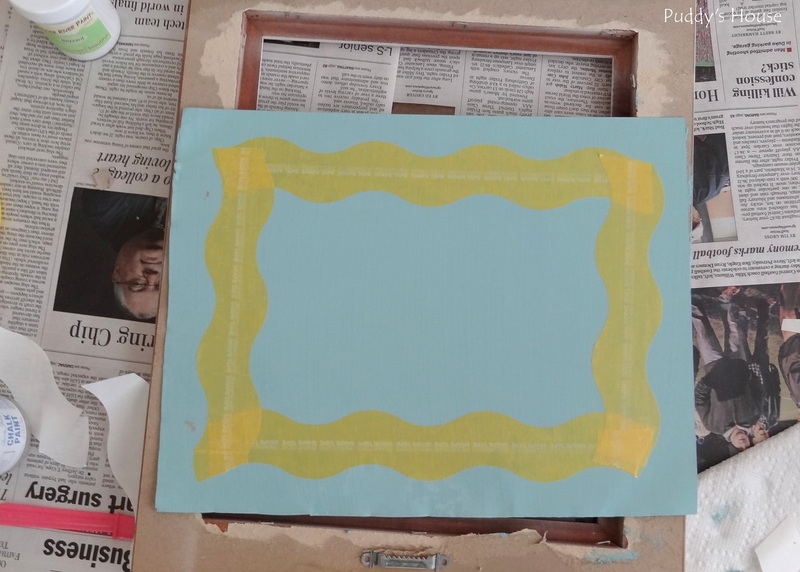 I didn’t want to spend much money, since I had already wasted it on the can of the magnetic paint – glad I had got that half priced! 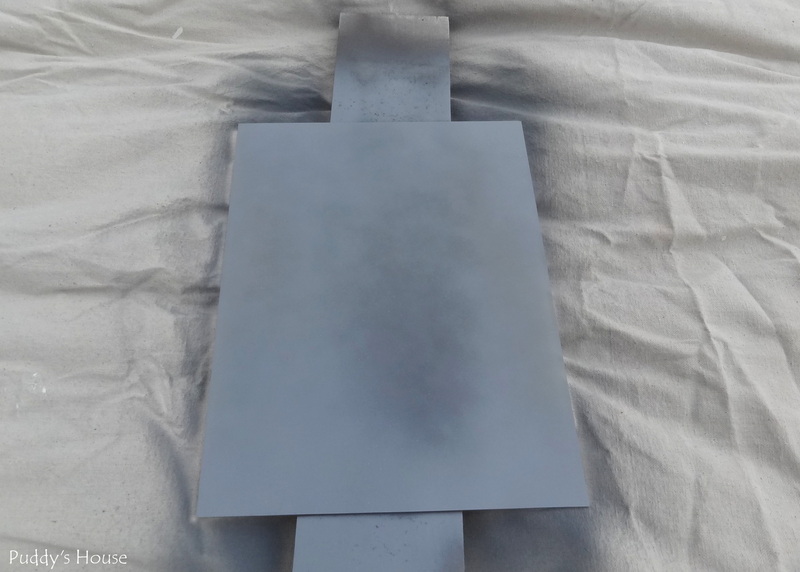 So, finally a few weekends ago I bought a piece of 12 x 16 piece of sheet metal at Lowe’s for $4.77. I really only needed 11 x 14, so that was as close as I could get. 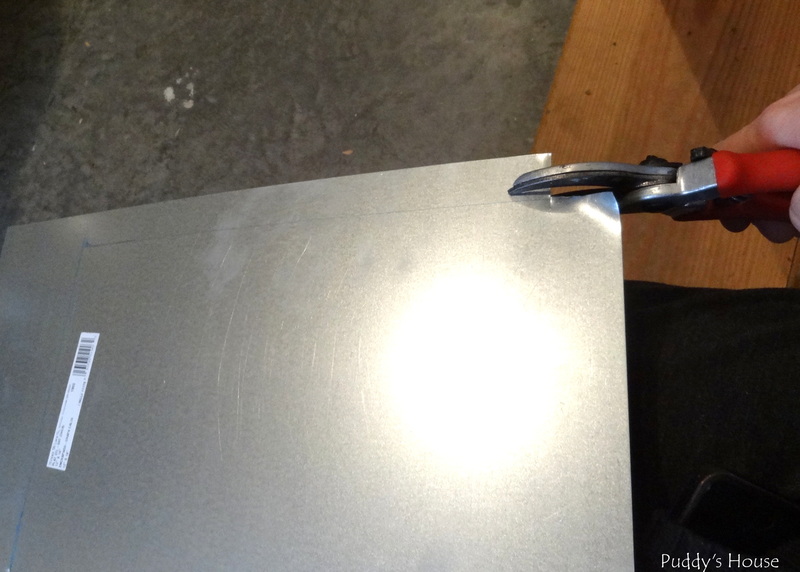 Now, I was stumped again….how to cut the sheet metal? I decided to use trial and error as my approach. We have plenty of tools in the garage, so one day I just started using them. None were very successful initially, I tried wire cutters, a saw, and I think they were wire strippers. I didn’t know they were wire strippers until Bob told me. 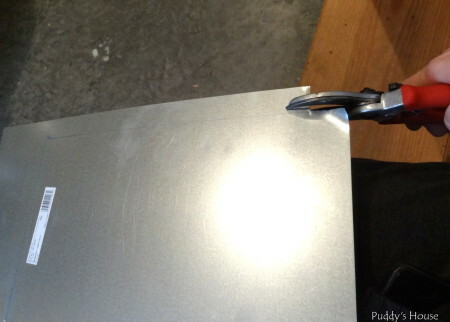 They actually cut the sheet metal, just not very nicely or easily. Then, Bob said I should try another tool, which I didn’t think would work because they are only my gardening trimmers. But, he was right, worked like a charm. I was able to cut right along the lines that I had traced onto the sheet metal to cut it to the right size. 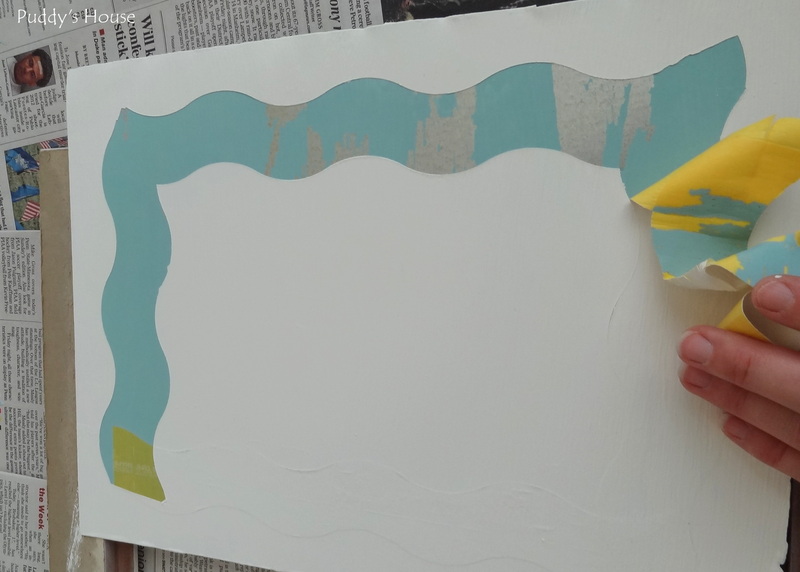 Once it was cut to size, then came the fun part, painting. I was determined to use what I had, just to see what I could come up with as a finished product. Here are my supplies: two colors of chalk paint, Frog Tape shape tape, and a brush. I got all of these items for free when I was at the Haven Conference. 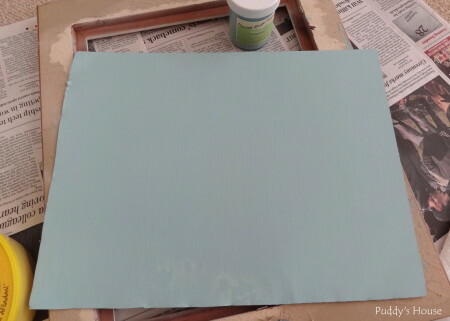 The turquoise is a bit bright for me, but I didn’t want this to be too boring of a project, so I went for it. 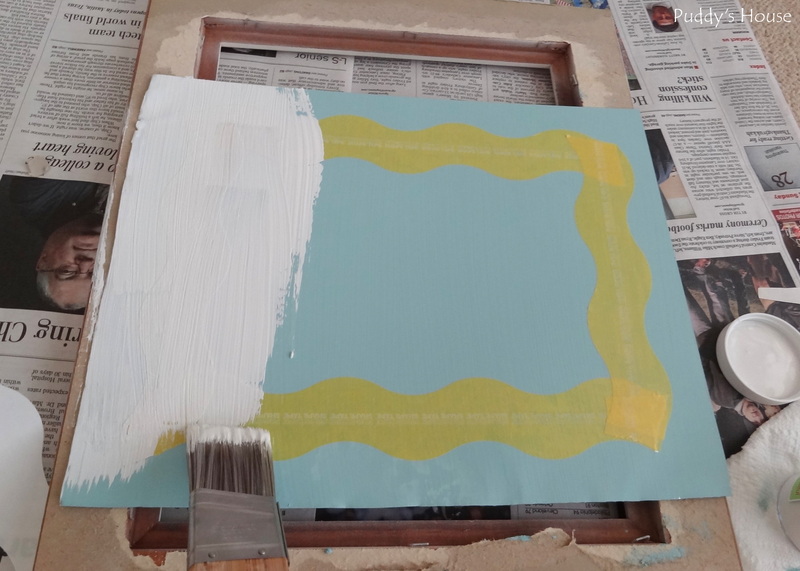 I painted the turquoise first. It took a few coats to get it a nice color. My time was limited, so I think it was spread out over several days, which in my case probably meant several weekends. After I had it coated well and it was definitely dry, then I applied the Frog Tape. 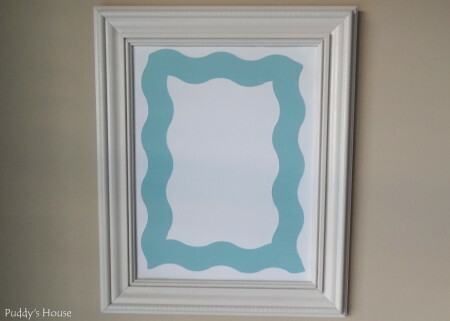 I didn’t want it to be too busy of a pattern, so I decided to use the wave tape to make a bit of a frame. Getting each corner to meet right was a challenge, and they still didn’t turn out perfect, but they are good enough for me. After I had the tape applied, I started to paint the white over top. I just fully coated the whole sheet, and again it took several coats. After allowing to dry, which was again at least a whole week, I finally removed the tape. 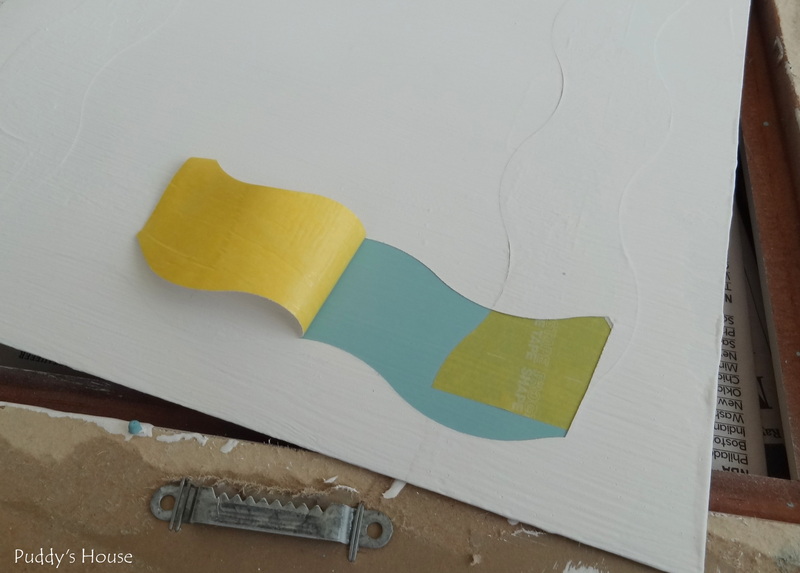 I removed the tape very slowly and I was quite excited to see such nice crisp lines when I began removing the tape. But, I was quickly not as excited when the turquoise paint also started to come up with the tape. I don’t know what caused it to remove the paint too, but it was not fun. 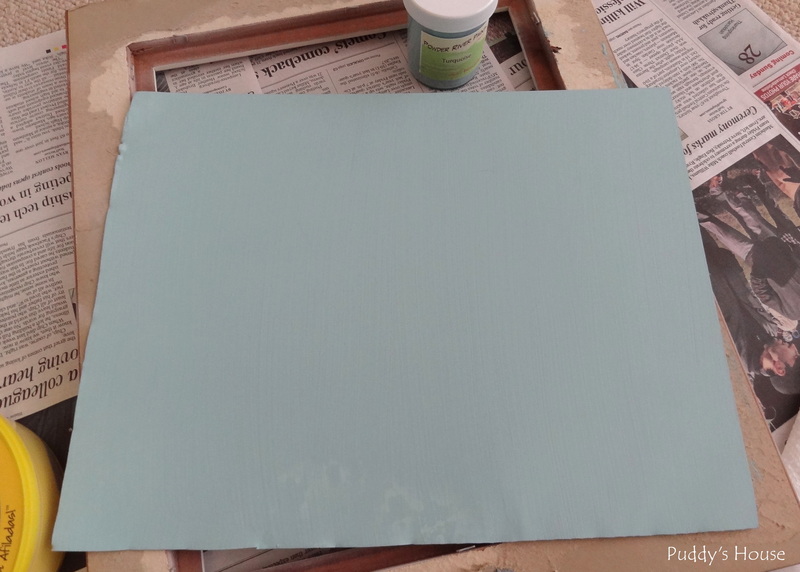 Fortunately, since the lines were so crisp, I just used a small artist brush to touch up the turquoise paint without having to tape again. After my touch-ups dried it was finally time to put the sheet metal inside the frame and hang it. Probably not the most exciting DIY project, and it may have been the most drawn out project, but I am happy with the results. I finally have a pretty place to keep the magnets that I can see them regularly. It’s already pretty full…maybe I should have used a bigger frame and sheet metal! Oh well! I’m happy with the results, and glad I remained persistent even when my original project failed. Have you had any DIY fails? Did you give up or try again? Anyone else collect magnets from your travels? That looks great! 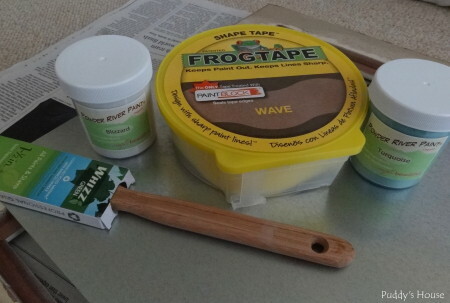 I love the way you used the frog tape! 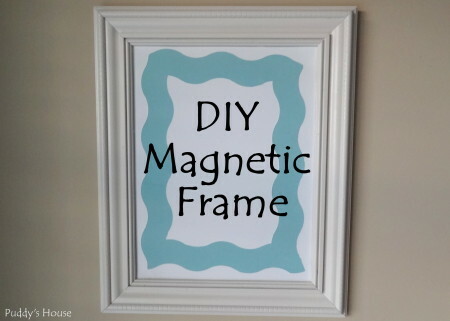 I have also tried that magnetic paint and it didn’t work for me either! Thanks Kim! I was so disappointed with the magnetic paint. But at least with your suggestion my project could still be completed. Thank you…I never would have thought of sheet metal! !